Today I’m writing over at www.proverbs31.org for their Encouragement for Today devotion. In case you missed it, I wanted to share it with you too! Lived blessed! You are. I became a Christian when I was a teenager. But even after I made a commitment to follow Christ, feelings of inferiority, insecurity and inadequacy held me hostage. The dirge of “I’m not good enough” was a song I couldn’t get out of my head. The lies of the enemy kept me fenced in and kept God’s best at bay. I felt I was always disappointing God and certainly a disappointment to myself. I tried the best I could to be the best I could be, but, in my mind, I always fell short. So I settled into a stagnant faith, a safe faith, a stuck faith with other defeated believers who falsely saw themselves through a filter of past sins and failures, rather than through the lens of their new identity in Christ. After high school, I went to college where I met and married an awesome Christian man. About four years later, I became a mom. Life was good, except for this termite-like gnawing in my gut that I just didn’t quite measure up to all the other church-moms with their smiling faces. I walked around with the fear that one day I would be found out — that one day, folks would figure out I wasn’t all I was cracked up to be. I lived under an undefined, self-imposed standard of approval. Childhood echoes of “you’re so ugly” and “what’s wrong with you” and “you can’t do anything right” left me feeling congenitally flawed. I sat in Bible study groups like someone in a hospital waiting room: hoping for the best but expecting the worst. My greatest fear was that I’d be no closer to being free of the insecurity than before the study began. In my mid-30s, I sat under the teaching of an older woman in my church. She opened my eyes to the truths in Scripture about who I was as a Christ-follower, what I had, and where I was (my position) as a child of God. I’d read those verses scattered throughout Scripture before, but when she encouraged me to cluster them together into one list, God began a new work in my heart. These truths were right there on the pages of my Bible in black and white and a few in red. I knew the verses were the infallible Word of God, but I felt rather squeamish hearing them, reading them and believing them. I was at a crossroads, one you might be standing at this very moment. Was I going to believe God and begin seeing myself as God saw me, or was I going to continue believing the lies of the enemy and the echoes of my past? Was I going to remain stuck in a stagnant faith because I was too insecure to take a step toward the abundant life Jesus had promised, or was I going to march confidently around the walls of my inadequacies until they came tumbling down? Finally I prayed, Dear God, I’m going to believe who You say I am. I don’t feel it. I can barely think it. But I’m going to believe Your Word is true for me and about me. Heavenly Father, thank You for choosing me to be Your child. 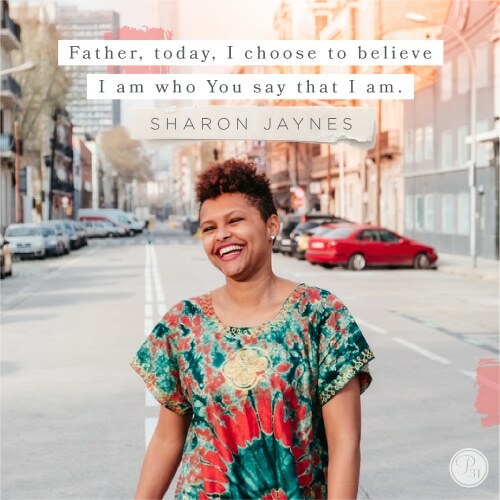 Today, I choose to believe I am who You say that I am —Your holy, dearly loved child … equipped by You, empowered by the Holy Spirit and enveloped in Jesus Christ. In Jesus’ Name, Amen. Have you noticed it’s easier to believe what God says about Himself than what He says about you? Jesus said, “I am the light of the world” (John 8:12b, NIV). We read those words and shout, “Amen! Hallelujah!” But He also said, “YOU are the light of the world” (Matthew 5:14a, NIV, emphasis added). Hmmm. Not a lot of shouting going on with that one. So which is it? Both! Decide today to believe what Jesus said is true about you! 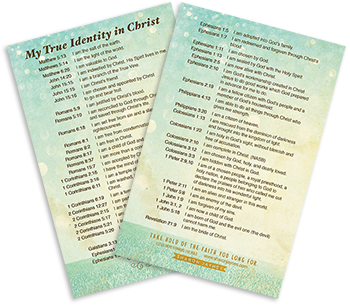 Write these truths and corresponding verse on an index card and make them yours today. It’s time to start believing the truth about who you are as a child of God. Check our these two amazing resources at sharonjaynes.com. The word God gave me today was “shout”. Then I read your devotion study. Matthew 5:14a…”you are the light of the world”. In obedience to God…I now SHOUT…. Your wordsite truly touched my heart, soul, and mind. Thank you and Praise God! I’m taking hold of God’s truth! Thank you for your inspiring words and candor in sharing your experience. God’s best blessings to you and yours. I don’t usually leave comments but after reading your powerfully worded article I want to take the challenge to declare & to regularly pray into reality “I’m taking hold of God’s truth about who He says I am”. His opinion is ALL that counts. Not the putdown generalisations about how I fail (I already know I am not perfect) that I too often hear from my husband, supposedly a Christian but who speaks as I believe he was spoken to as a child. So hard not to be impacted by hurtful, damaging words that I know are not from God. I’m resolving to pray for my husband to also take hold of the truth about who he is in God and finally stop the putdowns (of me and our daughters at times too). May God work in our hearts to convict about what God says is true. Really appreciate anyone reading this to please pray for the change I know God alone can bring in me, my husband and in how we relate. God does set His people free and transforms our minds by His Spirit planting God’s truth in us. “I am taking hold of God’s truth!” Thank you for showing me how to do this! I’m taking hold of God’s truth! Thank you for sharing an experience that so many of us go through but feel so alone. I choose today to see myself as God sees me. I am taking hold of God’s truth! Thank you so much Sharon. I am eternally grateful. I just needed to know this. I’m taking hold of God’s truth! I am taking hold of God’s TRUTH! And I am praising Him for His patience with me and faithfulness to me. I’m taken hold of God’s truth! Thank you Sharon for your testimony, I really needed this! I Must Remember (which is my problem)… in every temptation to take off the old and put on the new which is Christ in me. His Righteousness. His Grace saved me. I am His. So I need His Word daily. I need His Armor to protect, defend, bold, and to be faithful and fearless. We are at war Sisters.. Thank you! You are an amazing writer. God bless your ministry. This sounds like me so Today!! 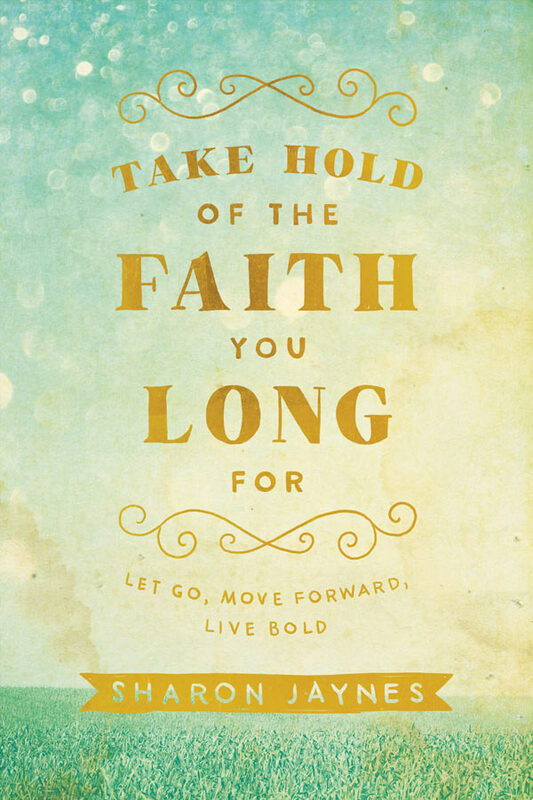 I am taking hold of God’s truth whether I feel it or not!! I’m taking hold of God’s truth! Thank you. I know who I am in Christian, but I forget over and over. I am taking hold of God’s truth and His great love for me. Thank you for the reminder! I am taking hold of God’s truth. Sharon is a real gift to women in this generation,God bless you dear sister.